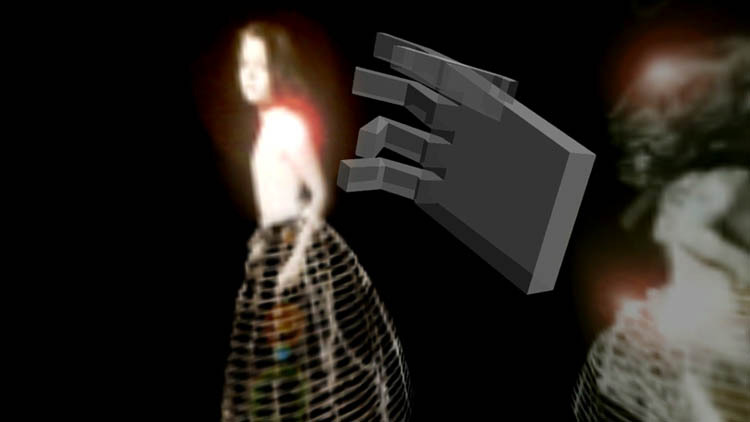 1993, a virtual reality murder mystery – part movie, part performance – was created at The Banff Centre for the Arts in Canada, in collaboration with Michael Mackenzie. It is an immersive interactive narrative piece. It combines interactive computer graphics, laser disk video and slides with interactive sound, and takes approximately forty minutes to experience. As a viewer you navigate the piece with a small plastic camera that allows you to “look” around the spaces and a glove that allows you to start and stop and to touch objects. In the first segment, a dream sequence, touching an animated figure takes you through a path in the architecture which has a narrative segment attached to it. You are in the point of view of the Coroner, one of the two main characters. It is her dream – a memory (forgotten in waking life) of being adopted as a child from the city to which she is returning to investigate the murder of a child. There are three environments. The first (the dream) is based on a Piranesi prison drawing, the second is a human ribcage that functions as the transport plane which brings the Coroner to the city. In this second environment orienting your virtual body in the space causes you to collide with invisible planes. These become cloud banks that trigger sections of narrative and bleed-through memories of a child, the violinist, who has been murdered. The third environment is a copper wire hand. The hand is a short term memory construct built by the Pathologist, the other main character, who is overwhelmed by memory and can’t function in the present. The objects in the hand are memories – some are of forensic details of the autopsy of the child and tell the story of her life in the city. The skull, with its wireframe brain inside, is the Pathologist’s longterm memory. When you touch these objects they grow large and you enter them, moving around while you hear accompanying sections of narrative.